Recommended Citation: Petkov, D, R B Misra, and O Petkova. Some Suggestions for Further Diffusion of Work System Method Ideas in Systems Analysis and Design. In The Proceedings of the Conference on Information Systems Applied Research 2008, v 1 (Phoenix): §2733. ISSN: 0000-0000. The Work System Method by Steven Alter has a significant potential for improving requirements definition in information systems development. Previous publications on the Work System Method and also on Design Science concepts and their relevance for Systems Analysis and Design are reviewed. 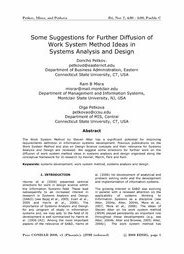 We suggest some directions for further work on the diffusion of work system method ideas in systems analysis and design organized along the conceptual framework for IS research by Hevner, March, Park and Ram.